This is what was crowding my mind while walking at the Dumbo Art Festival yesterday. 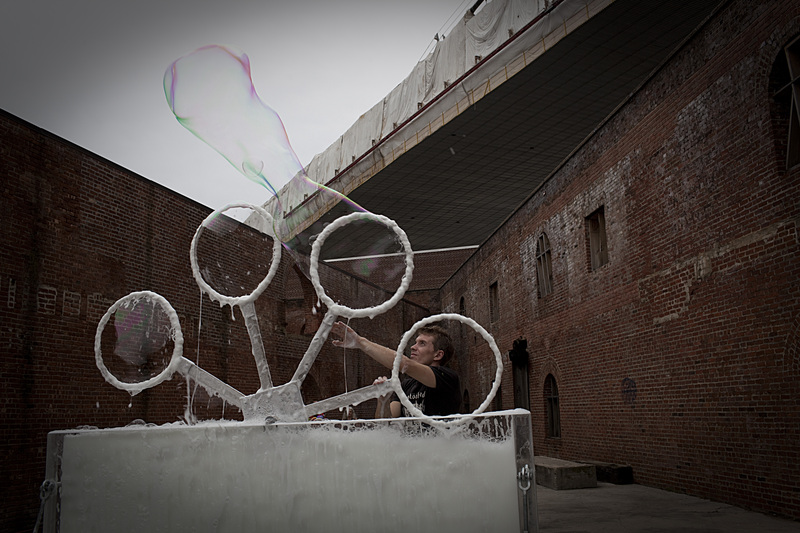 Is making soap bubbles with a giant “soap-bubbles machine” art? And if so who cares? Being a photographer myself I see the art and crafts of my medium, even though, I have always used it as a way to communicate journalistic stories, so more like a visual story telling technique than a mere art. But then again, I admire and respect the work behind a more fine-artsy photograph and the suddler messages engraved in those photos. Art, in order to be so defined, has to communicate to the viewer some strong emotions, not just a silly laugh and a passing-bye-one-second-long look. Art should move your intestine inside out and make you think why this person behind the photo or the art object created has something to tell me and why does the artist choose to tell me this way and who cares to listen? Art is not everywhere and it is not everything. Art is a statement. Art is a bold statement. Art is powerful and rough. Art is not exactly everything we invent and make out of nothing. A piece of art has so much study and thinking and history behind it, that only few people are capable of building/painting/shooting it. Not everything is art and not just having ideas is art. Art is having those “different” ideas and putting them into action. Art is moving and chaotic. Art is moderate and silent. Art is subdued often to the pre-concepts of other artists who judge it. Art is intense and undefined as far as it moves you. Art is wonderful and dammed. Art sometimes has reasons behind it sometimes only feelings. But art is not art if it does not send a message *(even if different for everyone out there). So whatever you think the message of the soap bubble machine is here, let’s hope it at least just reminded you of when you were little and your mother put you in your first bubble bath and you sat in there hours mesmerized by the colorful rounded-shape bubbles flying everywhere.